Our contest rules have changed! Starting in March, the first 10 readers to identify the location pictured in the current print version of Geotimes receive a Where on Earth? T-shirt. From these 10 winners we will draw the names of the two respondants who will receive a Brunton 8099 EclipseTM compass. Please note that all contestants are eligible to win one compass per year and a maximum of three T-shirts per year. 1. 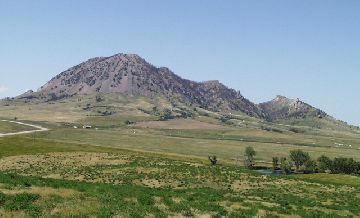 This Tertiary-aged igneous intrusion is of a type first described by G.K. Gilbert in the Henry Mountains of Utah. 2. This lone mountain, sacred to the region's indigenous people, lies at one end of a linear belt of volcanic centers that continues westward to the alien landing site in the movie "Close Encounters of the Third Kind." 3. In 1876 at a nearby town, "Wild Bill" Hickok was shot and killed while playing poker. His hand - aces and eights, Jack of Diamonds high - is now known in poker parlance as the "Dead Man's Hand." Paul A. Hale - Pittsburgh, Penn. Anne Wilson - Burton, Mich.
Peter Heitzmann - Woodbridge, Va.
Gretchen L. Hurley - Thermopolis, Wyo. Jim Sukup - Carmel, Ind. Mike Dyre - Fairfax, Va. Dawn Sukup - Bloomington, Ind. Cheryl Frischkorn - Santa Fe, N.M.
1. The only nearby town of any size was named for an Englishman who explored this still sparsley populated region in 1839 while aboard a ship named after a breed of dog. 2. In the bottom left corner of this photograph, taken during the region's dry season, is the top of a waterfall that is one of the many that cascade from this 500-kilometer-long 1.6 billion-year-old quartz sandstone cliff. 3. The land shown here is a national park but not owned by the national government: It is leased from the native people who have inhabited the region for more than 40,000 years. NAME THE CLIFF AND THE REGION AND COUNTRY IN WHICH IT IS LOCATED. 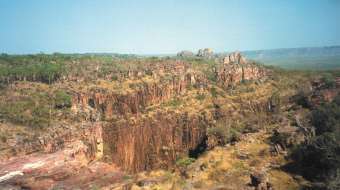 The cliff pictured here is the Arnhem Land Escarpment in the Northwest Territory of Australia.